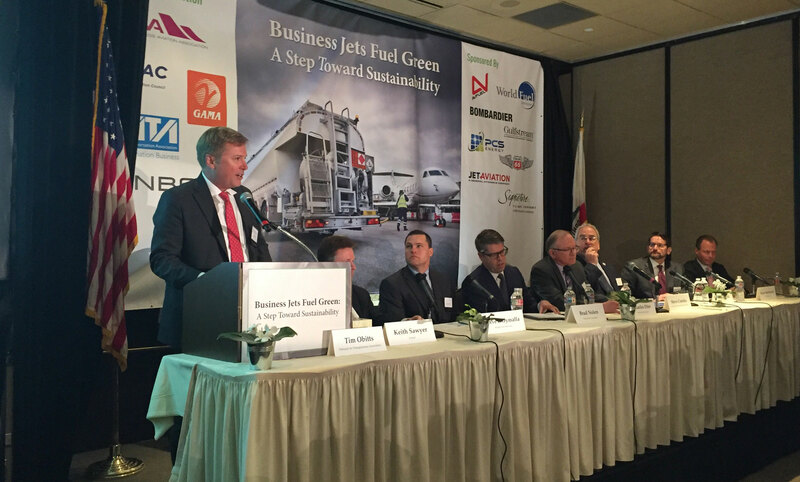 An event today at California’s Van Nuys Airport is supporting business aviation’s goal of carbon-neutral growth beginning in 2020 and ultimately a 50-percent reduction in carbon emissions by 2050. Dubbed "Business Jets Fuel Green: A Step Towards Sustainability" and sponsored by a coalition of industry organizations, including NATA, NBAA, EBAA, GAMA, and IBAC, the initiative aims to further educate and demonstrate to the business aviation community the use of sustainable alternative jet fuels (SAJF). Under development for nearly a year, the event, which will make SAJF available to all four FBOs at the Los Angeles-area business aviation hub, features a panel discussion on the seamless drop-in nature of the fuel and its future availability from industry experts, including fuel producers, distributors, and OEMs. Gulfstream, Bombardier, and Embraer have brought a G280, Challenger 350, and Legacy 500, respectively, to perform SAJF-powered demonstration flights for the nearly 200 attendees, and business aircraft fueling at the airport today will have the opportunity to use the blended fuel, provided by producers World Energy and Gevo and distributed by World Fuel Service and Avfuel. Most of the slowly growing SAJF pool is currently consumed by commercial aviation. “We don’t have the supply chain yet, so the point of the event is to demonstrate that the business aviation sector wants the fuel. Please give it to us, we’re ready to take it,” said NATA COO and general counsel Tim Obitts.